Panoptes, Infinite Mind is a massive, powerful Vex Hydra found within the Infinite Forest on Mercury. It is the Axis Mind that oversees the simulated realities generated by the Infinite Forest and uses them to shape the Vex's strategies in the "real" universe. It is the main antagonist of Curse of Osiris. Panoptes is housed within a unique Vex armature, resembling a massive Hydra chassis with an angular "head", two arms resembling those of a bipedal Vex unit, wing-like appendages, and numerous glowing Harpy "tentacles". Many components of its body float independently of one another. Panoptes was one of the first Vex who came to Mercury and converted it from a garden world to a Vex Machine World. Sagira used this origin point to locate Panoptes’ lair by projecting time forward, identifying Infinity’s Crown as the location within the Infinite realities that the Vex Mind could be found. It is Panoptes that directs the Vex's efforts into turning reality into what they desire: a future where the Vex reign supreme, Light and Darkness no longer exist and other lifeforms are destroyed. As such, the exiled Guardian, Osiris, has worked continuously to prevent this future but only managed to slow its progress. However, Panoptes' plans enters a new phase after the Traveler's awakening and cornering Osiris, forcing the exile to spirit his Ghost Sagira to seek aid. That aid turned out to be The Guardian who begins to disrupt Panoptes' efforts. With the Infinite Mind gone, the Vex have been left crippled and weakened but remain a threat that the Guardians and Osiris continue to fight together. Various efforts of the Vex to salvage themselves from Panoptes' defeat have been stopped, thanks to the Guardian's efforts. Panoptes is completely invulnerable to damage unless shorted out with an Arc charge, upon which it will expose its vulnerable "eye". 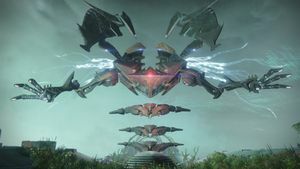 Although it does not utilize "conventional" Vex weaponry, it is capable of summoning simulated protectors (including simulated Vex, Hive, Fallen and Cabal) for defense, and can delete unwanted entities such as Guardians from the Infinite Forest at will. The Infinite Mind won't attack the players directly, beside sending more simulated enemies. Once all of them are defeated, Osiris will prevent Panoptes from deleting the player a total of three times at most. However, the player has to move quickly in delivering the Arc Charge as Panoptes' deletion attack will slowly eat away at their health. The term "Panoptes" translates from Ancient Greek to "all-seeing". The two main Vex Minds seen in the Curse of Osiris expansion, Argos and Panoptes, are named after the same character of Greek mythology. Argus Panoptes was a many-eyed giant who worked as a guardian and spy for the Olympian gods due to his abiltiy to see everything at any time. Certain elements of Panoptes' design grant it a strong resemblance to the appearance of Oryx, the Taken King; most notable among these are the "wings" on Panoptes' back, the wide and angular head with three small prongs or spikes, and the clawed arms. Given the Vex's past experience with Oryx, this resemblance may not be coincidental. Panoptes is the first Hydra that has been observed to have arms and additional appendages. Panoptes bears a strong resemblance to Quria, Blade Transform. Panoptes fighting Osiris and his Reflections.